The ability to work very rapidly with accuracy and style under pressure is a unique talent that links together the varied facets of Jane Rosenberg's unusual and fascinating artistic career. Born in Brooklyn, Jane Rosenberg started painting and drawing at an early age. She attented State University College at Buffalo where she received a Bachelor of Arts degree in fine art. She continued her artistic training in New York City at The Art Students' League of New York and The National Academy of Art and Design. Although her training at The Art Students' League under David A. Leffel was in classical painting and the measured and studied studio style of chiaroscuro, Rosenberg embarked on her first professional endeavor as a high speed, high pressure pastel portrait artist in the tourist trade in Provincetown, MA. It was in Provincetown that she first met fellow painters and portrait artists Simie Maryles and John Arana and together the three opened their own portrait studio. Although accuracy and style were a must, equally important were the ability to work very fast and to perform in front of a critical crowd. It was during this period of high speed portrait painting in the early 1980's that Jane Rosenberg began going to the courts in Manhattan to sketch. As it happened, she was sketching at the arraignment of a high profile murder trial when she counted the number of court artists and realized there were not enough for every television station. NBC had no artist. She phoned the station. They looked at her pastel sketches and decided to put them on TV that night. And so began the brilliant career of a nationally acclaimed courtroom artist that spans two and a half decades. Rosenberg initially worked as the first call artist for CBS News. She would be sent all over the country to cover trials, transported by plane, helicoptor or chauffeur. She has covered such famous trials for the television networks as John Gotti, Susan Smith, Woody Allen, the World Trade Center bombing trial of 1993, Michael Skakel, Martha Stewart, and, most recently, Worldcom. Her work has been seen on CBS, ABC, NBC, CNN and Fox News, and is in the permanent collection of The Museum of Television and Radio in New York. Speaking about the pressure to produce excellent work very quickly with no room for mistakes, Rosenberg reflects on the priviledge of "..getting a front row seat to the most exciting trials in the news. The work is hard and extremely pressured. Deadlines are immediate. There is no chance to work on anything after court ends. The cameras are waiting outside to shoot the sketches...My first sketches have to be out at 11am to make the noon show deadline. I usually come out again...around 3 with more sketches. I often think I could do so much better if I only had a little more time." In spite of the time crunch, Rosenberg's court drawings are lively, colorful, well-designed and extremely accurate. 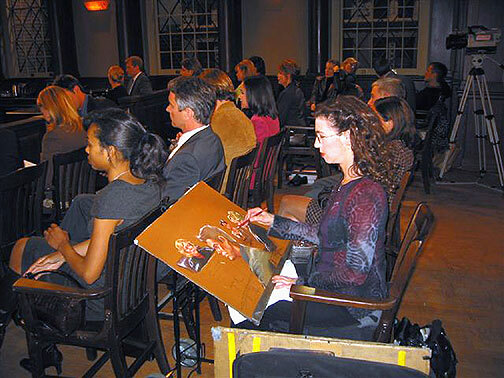 Throughout her busy courtroom career, Rosenberg continued to paint both in the studio and en plein air. She continued her art studies participating in painting workshops at Mes Illusions in France, at the Cape Cod School of Art in Provincetown and Laguna Art Workshops in California. Most recently she has undertaken painting en plein air in Manhattan, not a choice for the faint of heart. For an artist working outdoors in New York City, apart from dealing with the "constant buzz" of one of the world's most exciting cities, Rosenberg explains that "painting plein air in NYC means I have an audience and my work is not private, but being a courtroom artist has trained me to deal with this. I...try to find a spot off to the side of the throngs of pedestrian traffic. Many people are interested in watching an artist at work, and although many people try to engage me in conversation, I am able to remain focused. People often comment that I am an 'asset' to the neighborhood." In addition to her vibrant and spontaneous plein air paintings, Rosenberg also paints rich and painterly still lifes. Her works are particularly remarkable for their lush color, their artistic honesty, and the personality she manages to imbue them with, so that each piece is uniquely original and extremely engaging. Jane Rosenberg is a signature member of the New York Plein Air Painters. Her work is represented in collections throughout the US and abroad and in the permanent display of The Museum of the Constitution in Philadelphia. She lives in Manhattan with her husband.